This is really delish, it just got edged out of my regular rotation by microwaved apples. Which are also delish and don't have to be cooked ahead, and also come with bonus apple sticks. Not that roasting apples is so hard; if you have a little free headspace to pop a couple three apples in the oven, it'll be worth your while. Halve and core the apples, and arrange the halves cut side up in a 13 x 9 baking pan. Thin about a tablespoon of honey with about a tablespoon of hot water in a small bowl. The hot water will melt the honey a bit, then whisk them together with a basting brush. Brush the thinned honey over the cut apple sides, using it all up. Sprinkle with a bit of salt and cinnamon. Roast apples for twenty five minutes, turning the pan around in the oven halfway through if you think of it. 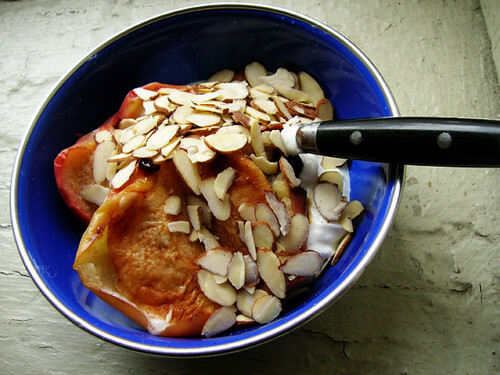 Let cool a bit, then plate two still warm halves right away with some greek yogurt and sliced almonds. The rest you can put away in the fridge to eat cold.